At Abacus Consult we aim to take advantage of the benefits associated with the effective application of new technologies and data management strategies to ensure that there only ever exists ‘one source of truth’. 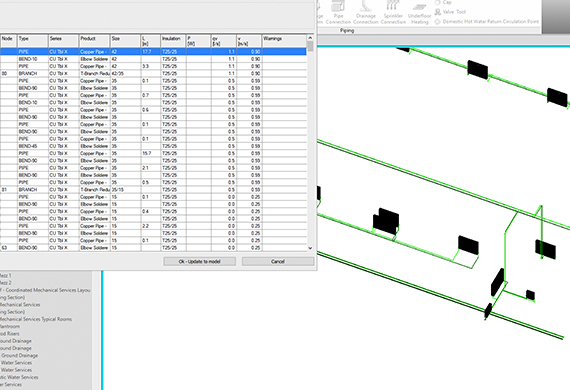 To this end, we calculate our MEP systems, wherever possible, directly from the modelled elements and from within our chosen design software. This allows us to produce the most precise set of construction documentation and provides us a competitive edge over many of our peers. This approach means there is little scope for human error and that changes to the modelled elements can be recalculated and reflected within the issued documentation accurately and efficiently. If you have any questions relating to our MEP Services Modelling & Coordination	do not hesitate to get in touch. We will be happy to discuss your requirements.